This one is a bit of a head scratcher. 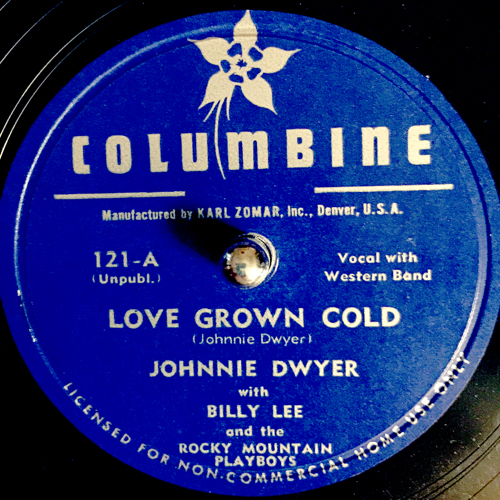 Credited on the pre-Band Box label Columbine as Johnnie Dwyer with Billy Lee and the Rocky Mountain Playboys. As there tended to be several bands calling themselves the same thing, I have no clue whether these guys are affiliated with Hank Locklin's, Jimmy Snow's, Rocky Rauch's Rocky Mountain Playboys. 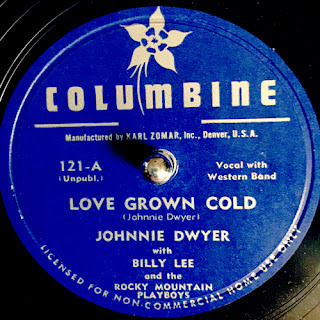 Johnnie (Johnny) went on to record at least one single on the Dee Jay label, re-recording "Love Grown Cold," with The Pike County Players--again there apparently was more than one group calling themselves that (sigh). That said, this is a sweet country ditty.